I’ve had these gigantic malted milk balls in my cupboard for months and never knew what to do with them. I mean, yeah, eating them was an option. But look how pretty they are! Too pretty not to use in some baking project! So, Google to the rescue! Of course malted milk cupcakes exist. Because why not? Plus malted milk balls to garnish. 1. Preheat oven to 350 F. Line muffin pans with paper liners. 2. In the bowl of a stand mixer fitted with the paddle attachment, combine the flour, sugar, baking powder, salt, and malted milk powder. Whisk until well combined. 3. Add the chocolate and butter to a microwave-safe bowl and microwave in 30-second bursts on 50% power, stirring in between each, until the mixture is melted and smooth. Stir in the oil until combined. 4. Add the chocolate mixture to the bowl with the dry ingredients, along with 1 cup of the milk and beat on low speed until combined, stopping to scrape the sides and bottom of the bowl once or twice. 5. In a measuring cup, whisk together the remaining 3/4 cup milk, eggs, and vanilla. Pour half of this mixture to the mixer bowl and beat on low speed until incorporated then add the second half and beat again on low speed until everything is combined (scraping the bottom and sides of the bowl as necessary). 6. Divide the batter evenly among the liners, filling each about 3/4-full. Bake for about 20-24 minutes, or until the cupcakes spring back when lightly pressed and a toothpick inserted in the center comes out clean. Remove the pan to a wire rack and let the cupcakes cool for a few minutes, then remove them to the rack to cool completely. 1. Add the chocolate to the bowl of your stand mixer. In a small saucepan whisk together the malted milk powder and heavy cream. Set the pan over medium heat, and stirring almost constantly, bring the mixture to a simmer. Pour the cream mixture over the chocolate (do not stir yet) and then cover the mixer bowl with plastic wrap. Set aside for 5 minutes. 2. Remove the plastic wrap and gently whisk the mixture until the chocolate is melted and smooth. Cover the bowl with plastic wrap and refrigerate for about 2 hours, or until well chilled. 3. Place the bowl on your stand mixer fitted with the whisk attachment. Cut the butter into 1/4-inch cubes. Start mixing on low, and gradually add the pieces of butter to the chocolate mixture in the bowl – let one incorporate before adding the next. After you’ve incorporated all the butter, increase the mixer to medium-high speed and beat until the frosting is smooth and thick. 4. Transfer the frosting to a large pastry bag fitted with a decorative tip. Pipe frosting into a swirl on each cupcake. 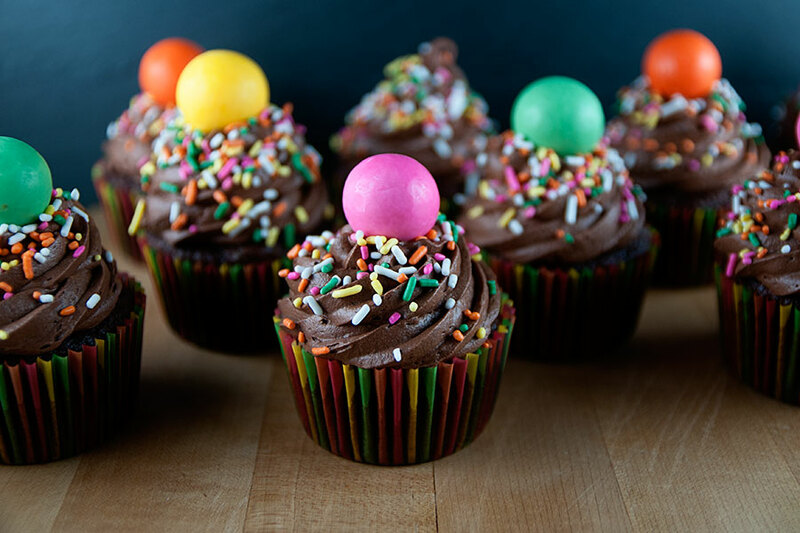 Garnish each cupcake with a malted milk ball, if desired.